Understand how new network technologies impact VoIP! Voice over Internet Protocol (VoIP) is revolutionizing the way people communicate – both in the corporate world and in personal life. The enormous success of VoIP has led to its adoption in a wide range of networking technologies. Each network technology has its unique features and poses distinct challenges for the performance of VoIP. VoIP: Wireless, P2P and New Enterprise Voice over IPdescribes the issues arising in the deployment of VoIP in an emerging heterogeneous network environment. 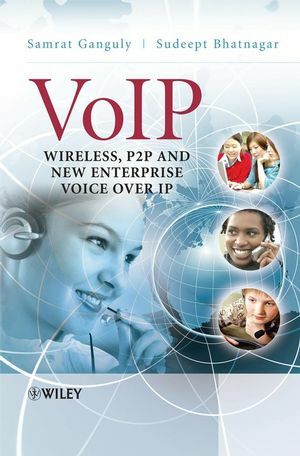 Along with a brief overview of the concepts, protocols, algorithms, and equipment involved in realizing VoIP, this book focuses on two areas: quality and performance issues in deploying VoIP over various network settings, and the new mechanisms and protocols in these emerging networks to assist the deployment of VoIP. Discusses the basics of VoIP, VoIP codecs and VoIP Protocols including SIP and H.323. Details new technologies such as P2P technology, VoWiFi, WiMax, and 3G Networks. Explains the QoS issues arising from deploying VoIP using the new technologies. Solves the performance issues that arise when VoIP is deployed over different network technologies. This book is an invaluable resource for professional network engineers, designers, managers, researchers, decision makers and project managers overseeing VoIP implementations. Market analysts, consultants, and those studying advanced undergraduate and graduate courses on data, voice and multimedia communications will also find this book insightful. Samrat Ganguly currently works as a Research Staff Member at NEC Laboratories America. He gained his PhD in Computer Science from Rutgers University. His research interests include VoIP over wireless mesh networks, streaming over 3G networks, Grid computing, and QoS issues. He has presented papers for conferences and workshops such as Infocom, PIMRC, and ICC. Sudeept Bhatnagar works as a Research Staff Member at NEC Laboratories America. His research interests include VoIP and Enterprise networks, data streams, wireless mesh technologies and energy-efficient protocol design for sensor networks. He gained his PhD in Computer Science from Rutgers University.? He has published over 20 papers in the area of networking and won the best paper award at the High Performance and Switching and Routing workshop.